Restore normalcy to your home or business with help from Specialty Construction & Restoration in Hattiesburg, Mississippi. We have a 24-hour emergency service specifically for when disaster strikes, including fallen trees, cars driven into buildings, fire, or water damage. We can provide an immediate, temporary solution to secure your property and then provide an estimate for your insurance company. Step into your home or business that looks and smells brand new again using our water and fire damage restoration services. 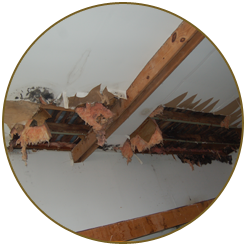 A small leak in your roof can cause permanent damage, including mold and bacteria build up. What can be even worse is a small kitchen fire getting out of control and destroying a whole section of your house. In these instances, you're going to want to make sure your insurance covers either home renovations or business renovations. Make sure you request an estimate before things get out of control. We use an estimating program that 80% of all insurance companies use. We can go over the estimate together, or we can save you the headache and send it directly to the insurance company for you. Don't get overwhelmed when tragedy strikes, and choose us to help you sort through the wreckage.